The boat just went through a yard session at LMC with balanced shafts, shaft seals, bottom paint, balanced props and prop speed.June and July of 2018 - In addition to yard work we also did: All exhaust removed and serviced as necessary, charged air system serviced including rebuilt turbos, complete system flush and service of the hydraulic system, main engines fluid change and main engine heat exchangers removed and serviced. Main engine heat exchangers removed and serviced.Passerelle removed, serviced and reinstalled.Trim tabs serviced.A/C chiller system was serviced with one brand new compressor and the other 2 have been swapped in the last two years.Paperwork available on all items.See full specs for walkthrough info and video. United Yacht Sales New Jersey would love to guide you through a personal showing of this 88' San Marino Raised Pilothouse 2006. 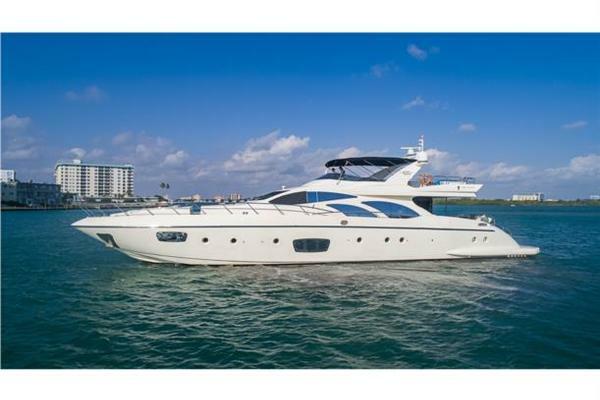 This yacht for sale is located in Fort Lauderdale United States and priced at $1,490,000. For a showing please contact us by filling out the form on this page and we will get back to you shortly! "Lori Ann" is a raised pilothouse design which flows very well into her attractive lines. The main design theme of this vessel is that of a spacious and flowing layout with all areas ready to be utilized in their own unique ways. Great mechanical features only bolster her attractiveness with a long range and impressive economy while still being able to get up and run.Large, practical yet comfortable aft cockpit leads into a spacious salon with recently refit custom sofa, ottoman with storage, cabinetry and actuated TV. Forward of salon is formal dining, day head and a service bar with a Scotsman ice maker. Large windows surround the entirety of the salon for natural lights and excellent vistas. Hardwood and tile floors and a wood accented headliner round this area with elegance.Continuing forward you will enter into a hallway leading to the galley as well as the grand staircase leading down to the staterooms. Prior to reaching the galley this hallway grants access to finished wood stairs leading up to the pilothouse. Under these stairs there is large storage closet and access to the central vac and air handlers. The ships main power distribution panels are directly across from the pilothouse steps. The vast nature of this yacht is on full display in the galley. Large open space in the center with galley to the aft of the room and a country kitchen style wrap around dinette forward. Large forward facing windows and rich woodwork really brings attention to this area. Features here include: wine cooler, Sub Zero stainless side by side refrigerator and freezer, drop down TV and both port and starboard ships doors which lead to the front deck.From the galley a trip down the wrap around steps leads to a landing and a foyer with full beam master to aft with guest and VIP staterooms forward. Master stateroom is big, bold and luxurious with an island king complete with mirrored headboard, pillars, accent lighting and built in night stands. Forward and starboard of the master features a huge walk in closet, flush mount flat screen TV and an upholstered built in lounge. En-Suite head is to starboard and aft. To Aft and port is another very large walk in closet which doubles as passage to a ships door which leads to engine room as well as laundry. Guest stateroom features two twin berths in lieu of a queen. The VIP is the V-berth with center island queen, impressive build ins for accent and huge en suite head. The showers on this boat are massive and all have lavish features to add some real enjoyment for owners and their guests.Crew quarters is accessed from swim platform via a transom, full size, ships door or an overhead hinged door and stairs down from the aft deck. Access is also through master and engine room. Long hallway runs transom to engine room. Crew head and crew bunk room to port with captains quarters and laundry to starboard. Lazerette located fully aft which contains water maker, massive storage area and some additional utilities.All exterior decks are done in newly laid teak. Port and starboard steps lead from large swim platform up to the aft deck. Aft deck has a hardtop mounted flat screen TV, JL tunes, overhead accent lights and a quartz table top. Large settee to aft with book ending stainless pillars make for an elegant and strong look. Opening hatches which contain line storage and the ships elevated aft corner cleats with Maxwell powered capstans. Forward and starboard is the upper hinged door to the staircase to laundry and crew. Forward and port is the teak staircase leading to the bridge.When arriving at the bridge you will again notice the immense nature of this vessel. Large open area to the aft which is currently set up simply with two moveable teak lounges. This area was originally laid out as tender storage with a davit to the aft. The current owners opted for openness and had the davit removed for a clean look. Wet bar with fixed stools to port and a half moon settee to starboard. Matching helm and companion lounges are full forward split in the middle by sliding door which leads to the pilot house. Upper helm located to port. The forward portion of the upper deck is covered by a hardtop with six matching square skylights and overhead LED lighting which provide a great ambiance to this unique and well laid out area. JL tunes throughout.The pilothouse features a centrally placed elevated captains helm chair. Chart storage, nav station, DC distribution for the upper levels and an upholstered lounge area. Great sight lines and a good design make this a very comfortable and practical area to run the boat.The bow deck has two large bosun style storage lockers. There is wrap around teak decking which really stands out. For comfort and lounging there is a multi layer sun pad. Full forward there are twin hydraulic windlasses which standout with their polished stainless features as well as two massive in deck anchor lockers. 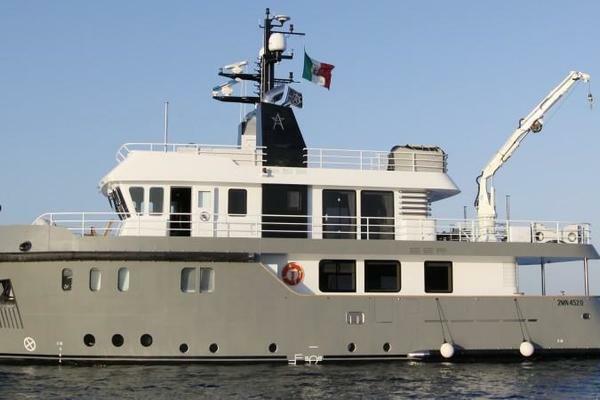 Because of the tall hull design of this vessel this bow deck is more elevated than others in her class which provides a great area to take in the sights which appeals to all types of guests.Outstanding mechanics complete the package. Sea Recovery watermaker, twin 31KW Northern lights generators, recently rebuilt CAT C-32 with under 200 hours on after completion of rebuilds. Work performed by CAT certified tech. Bow and stern thrusters, twin windlass units and NAID stabilizers - all hydraulic. Chiller AC system with all AC equipment fully serviced. All safety gear including EPIRB, fire system and life raft, sat phone.All headliners are in great shape, interior shows as very lightly used. Big strong and stable vessel. 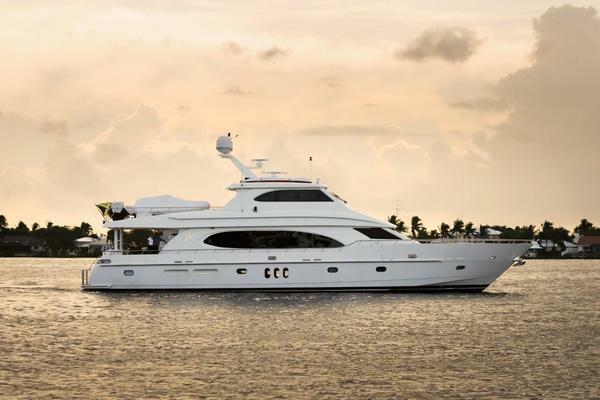 If you are in the market for up to 100' vessel Lori Ann is a must see. Complete list of service items as noted on front page of listing. 20-21 knot cruise. Very efficient with an impressive 120 gallon total burn per hour at fast cruise speed (only 65 - 70% engine load). At 16-17 knots your burning 100 per hour at 50-55% load.